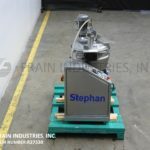 Stephan Model UMHC40E, 40 liter, stainless steel, steam jacketed, pilot plant, vacuum cooker and cooler with pounds of product per hour – depending on materials, application and machine configuration. Bowl is rated for full vacuum and internal steam pressure rating of 55 psi. Jacket pressure rating of 29 psi. 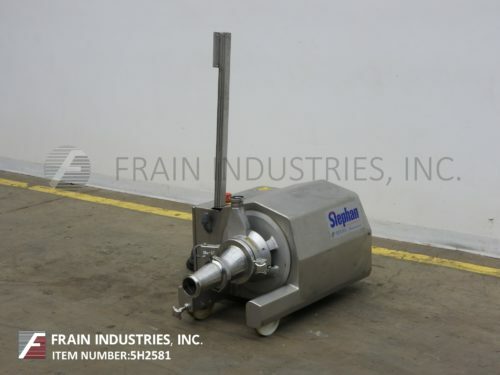 Maximum process temperature of 260° F. Equipped with flip up, bolt down cover, top mounted side scrape agitator, product funnel and vacuum gauge, direct steam injection, chopper timer, temperature probe, serated blades, side bottom discharge and locking tilt discharge. Auxiliary pieces including vacuum system with vacuum pump, condensation tank, and hot / cold water connections. Control panel has product, water feed, jacket, vacuum, tank and condenser controls with thermostat steam temp and chopper timers. Mounted on a 102" long x 51" wide stainless steel platform. Designed for pilot plant operation and can be run manually, semi-automatic or with pre-determined programs from solid state controller, and can produce a wide range of product procedures in one machine such as fine cutting, cooking, blending, emulsifing, deaerating, sterilizing homogenizing and pasteurizing under vacuum pressure with heating and cooling. 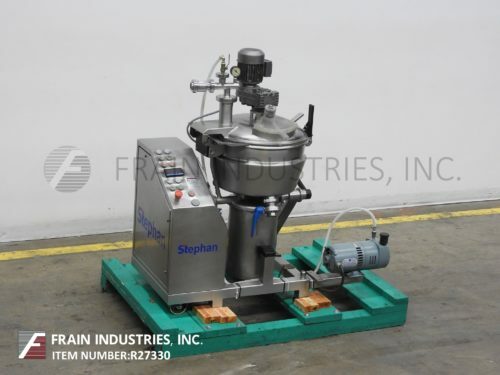 Stephan Machinery, Model HCHD30-II, stainless steel Mikrocut emulsifying processor. Rated from 2,645 to 9,920 lbs per hour – depending on materials, application and machine configuration. Equipped with 37" long x 28" wide x 15" deep product hopper, feed auger into cutting set and a 3¾" OD / 2¾" ID seated bevel discharge. Knives and auger powered by 40 Hp drive. Mounted on a stainless steel pull cart base with casters. S/S continuous fine cutter/emulsifier with pre-feeder capable of an output up to 8,800 lbs./hr. Equipped with a 15 hp stuffer in feed, 3.75" diameter product inlet/outlet in the cutting chamber, hinged cutting housing door, and powered by a 118 hp motor. Ideal for wieners, bologna, baby foods, pet foods or any other cooked stable emulsion. Last used in a pet food operation. 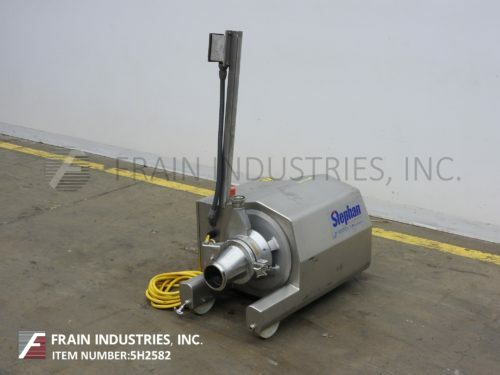 OAD: (L) 96" x (W) 46" x (H) 76"
Stephan Machinery Model CHD10011CS stainlesss steel, micro-cut, double cut emulsifier rated from 0 to 8000 lbs per hour – depending on materials and application. 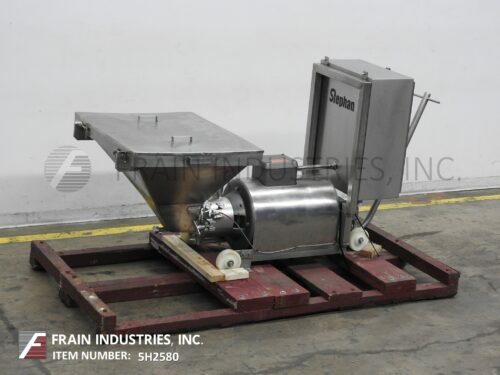 Equipped with 14-1/2" long x 12-1/2" wide x 17" deep stainless steel product hopper, 10" diameter 2-piece cutting head includes feeding screw, and feeding disc, tungesten carbide teeth and 4-1/2" OD sanitary discharge and 200 Hp motor drive. Mounted on stainless steel base. Excellent for production of weiners, bologna, baby food or other cooked stable emulsions. Stephan Machinery, Model TK150, 150 liter capacity stainless steel horizontal mixer. Rated up to 800 kg / hr depending on materials, application and machine configuration. Chamber dimensions: 22.5" diameter x 21"L. Equipped with a 13¾" x 8½" charge port with hinged cover, single arm mixing bar, scrape agitation, steam injection and 15" x 8½" hydraulic slide gate discharge with 28" ground clearance. Control panel with push button start / stop, push button open / close and touch pad display. System includes a 1 hp hydraulic pack and 9Kw steam generator. Mounted on a stainless steel base with casters. 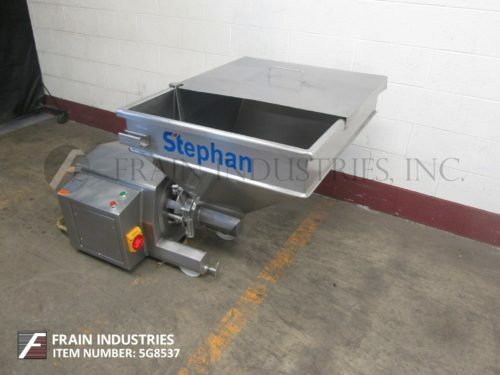 Stephan, Model VCM44E, 40 quart, vertical, bowl chopper / mixer with number of pounds of product per hour – depending on materials, application and machine configuration. 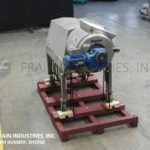 Equipped with a 19½" ID x 11" deep stainlees steel mixing bowl, 2½"OD / 2"ID tri-clamp style butterfly valve drain, (2) 7" long bottom chopper / mixing blades, 90° tilt, flip up / bolt down cover, top mounted vacuum pressure gauge and low pressure jacket. ½ Hp top side scrapper motor drive and two speed (1750 / 3500 rpm) ( 8 / 12 ) Hp bottom chopper blade motor drive. Includes a 1½ hp vacuum pump and control package with start / stop, slow / fast, push buttons with digital readout and e-stop. Stephan, Model UMM SK-25, 25 liter, vertical, vacuum cooker and chopper with number of pounds of product per hour – depending on materials, application and machine configuration. 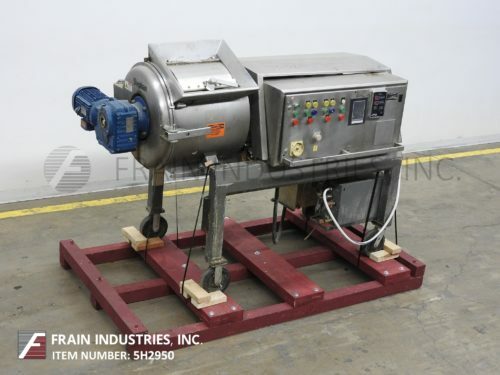 Equipped with a 17" ID x 9½" deep stainlees steel mixing bowl, internal steam jet nozzles, (2) 6" long bottom chopper / mixing blades, 90° tilt, flip up / bolt down cover and low pressure jacket. Manual top handle side scrapper and two speed (1750 / 3500 rpm) ( 5.3 / 6.7 ) Hp bottom chopper blade motor drive with speed selection switch. Mounted on (4) leg base frame.